Due to technical problems we have closed the registration. We will open it again immediately that they are resolved. Sorry for the inconvenience. In each period you can enrol both a morning course and the Spanish basic course in the afternoon. (*) During the first two weeks of this period, classes will run from 9 a.m. to 1.30 p.m. as Monday 24 June is a regional holiday. SECOND PERIOD: 15 July to 2 August 2019. Monday to Friday, 9 a.m. to 1 p.m. AFTERNOON COURSES: Monday to Friday, 3 p.m. to 5 p.m. In first(*) and second periods. (*) During the first two weeks of this period, classes will run from 3 p.m. to 5.15 p.m. as Monday 24 June is a regional holiday. 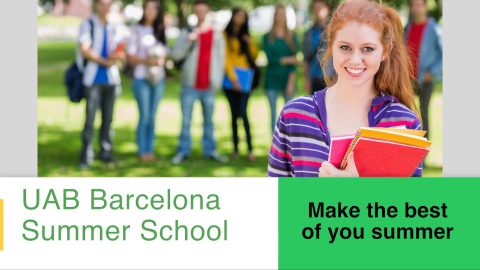 UAB Barcelona Summer School comprises a training offer of undergraduate subjects in a range of fields, and takes place at the UAB Campus from late June to early August once the ordinary academic year is over. The courses are mostly taught in English, being intensive programmes consisting of at least 55 contact hours over a three-week period. During the afternoon the Complementary Basic Spanish course will take place, including at least 30 teaching hours, in a three weeks period. Classes take place in the mornings (9 a.m.–1 p.m.) and students are recommended to spend between two and three hours per day on self-guided study. Concerning the afternoon course, the lessons will run from 3 to 5 p.m. and students are recommended to spend one hour per day on self-guided study. (*) During the first two weeks of this period the lessons will take place from 9 a.m. to 1 p.m. since Monday 24 of June is a regional feast.Concerning the afternoon course, the lessons will run from 3 to 5:15 p.m. The UAB Barcelona Summer School is open to undergraduate and postgraduate students, both local and international. All undergraduates must already have taken at least half of their first-year courses. They should also have a good knowledge of the working language. UAB undergraduate students can enrol on a total of 12 ECTS credits: the equivalent of two courses - one for each period- which can then be recognised as optional credits on their degree. They cannot take courses that are on the study programme of their degree. Postgraduate students can take any course but cannot include it on their transcript. The enrolment fee is €200 per 6-credit course. If you have any queries about enrolment, please write to summer@uab.cat. There is a 20% discount on the enrolment fee for students from the YERUN Network and ECIU Consortium. Non UAB students who enrol before the 1st of April will receive a 10% discount over the official price. Visas: Students from countries on section 1 of the list need to apply for a visa to enter in Spain. To get their visas on time they should make their applications two months before the course starts, by writing to the appopriate Spain consular office, depending on where they live. Medical insurance: All foreign students at a Catalan university must have medical insurance coverage. The procedures for obtaining this coverage vary from countro to country. Morning courses are worth 6 ECTS credits (European Credit Transfer System). Afternoon courses are worth 2 ECTS credits. In the case of international students, your home university can transfer these credits to your transcript (depending on its regulations), especially if it has a mobility programme in place with the UAB. UAB undergraduates should take the certificates for courses they have passed to the Gestió Acadèmica (Academic Management) of their faculty so that they can be recorded on their transcript as optional subjects. However, UAB undergraduate students will not be able to enrol on any course which is part of their study programme. The courses selected can not be part of their study programme and they will be included in their academic record once passed with the qualification PASSED, that is, without numerical grade. The fee for these students is 15% of the price of official credits. UAB undergraduates can take up to 36 ECTS credits for their degree, if it has a total of 240 credits, or 27 ECTS credits, if it has a total of 180 credits, at the UAB Summer School. Vila Universitària is the residential area of the UAB campus, located in a natural green belt of park land and forests. In the Vila apartments you will quickly feel at home, in a comfortable, relaxing environment. It is a few minutes' walk from Vila Universitària to Bellaterra train station, which offers a great connection with central Barcelona, just 20 km away, and also easily accessible by road. The residential area is within walking distance of the UAB faculties and over 40 research centers. For reservations: please, contact to vila@vilauniversitaria.com and ask for “Aldara Gonzalez”. Please, let her know you are enrolled at the UAB Barcelona Summer School in order get an especial discount. Use “UABSUMMER2019” as a promotional code so they would offer you special conditions on the booking. Attention! No rooms available for the first term. 2 restaurants and 1 bar/coffee shop at the Hotel Campus. 2 bars/restaurants in the halls of residence area. Outdoor swimming pool, football field, beach volleyball court, 2 table-tennis tables, 2 street basketball systems, garden. Stationery and candy store, grocery store, launderette and 2 ATM machines. All students from the UAB Barcelona Summer School 2019 will have free access. Its offers accommodation in Barcelona city centre. For reservations: please, click on bcu.cat/en/accommodation-in-barcelona. It offers 10% discount for students enrolled at the UAB Barcelona Summer School. Please ask for the promotional code “UABSUMMER2019”. It offers apartments and rooms for students in Barcelona city centre. For reservations: Please contact them using this address: shortstays@resahousing.com. Ask for the promotional code “UABSUMMER2019” to get a 10% discount. The Buddy Programme for the UAB Barcelona Summer School has the objective to allow international students who participate in the UAB Summer School to meet UAB students, get to know our culture and participate in university activities. Wednesday 26 June/Wednesday 17 July: Here, with the excuse of practising your languages you can meet up with local and international students and exchange experiences through games and activities. Thursday 27 June/Thursday 18 July: Everyone should bring a dish that is typical in their country and we will all have lunch together. This is a great way of finding out about other cultures through food! You can also take avantage of the time to ask the buddies for information about the places you would like to visit, or organise activities with them. 1pm International lunch. Meet the buddies! Tuesday 2 July/Tuesday 23 July: This workshop offers the opportunity to get closer to Catalan and learn a few words and phrases that will be helpful during your stay and make it much more interesting. Wednesday 3 July/Wednesday 24 July: Get to know the UAB campus from a different viewpoint and visit the green spaces and woodland and streamside pathways. Thursday 4 de July/Thursday 25 July: The Ganàpies is the human castles team of the UAB and they will tell you all about the castles and show you some of the basic techniques for building them. Anyone who daares have a go can try yo be a 'casteller" for a day! Students from UAB Barcelona Summer School have free access to Servei d'Activitat Física - SAF (UAB Sport Facilities). In order to access to SAF students must contact to summer@uab.cat. Mammoth presents a short film commissioned by Catalonia's Tourism Department for Barcelona Province.